Every year we service over 1,500 Clients for Lawn Aeration, Summer Mowing, & Raking in the Colorado Springs Area. Our good name, hard work, & professional guarantee has kept us going strong since 2001, and we’re still growing. Clients can count on us because we are a small family owned company. We offer competitive prices while still having the ability to give great customer service. We are like the neighborhood kid down the block only a lot more reliable. We only specialize in Residential & Small Commercial Professional Lawn Maintenance Services so clients know we’re giving them the best job for the best price, every time! Proper maintenance is the key to keeping your yard healthy and beautiful. At Intermountain Lawns we are dedicated to quality in our workmanship. Proper maintenance is the key to keeping your yard healthy and beautiful. Our Weekly or Every 2 Week mowing and trimming service will keep your lawn looking great while you enjoy more time with your family & loved-ones. We cut at a recommended 3″ -4″ height, but every lawn and customer is different. We keep records of the height you want the lawn and tailor our services to fit your needs. We also recommend dropping or mulching the clippings back into the lawn to recycle them, especially if you’re on a weekly schedule and only cutting about 1/3 of an inch at a time. The clippings release nitrogen back into your lawn which acts as natural fertilizer, but some prefer the clippings to be bagged. So, in addition to mowing & trimming, if bagging is preferred, our service also includes bagging the clippings and hauling them away. Finally, we blow any excess of sidewalks & driveways like we weren’t even there! Simple, easy, inexpensive, and convenient for you. Just add water… and leave the rest to us! 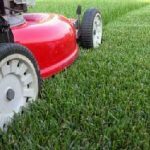 Our Mowing Service includes trimming around sidewalks, fences, trees, and any reasonable part of a lawn that can’t be reached by a lawn mower with a string trimmer/weed eater at no additional cost, preferring to stay within the border of the lawn. Anything outside the border of the lawn such as rock or mulch areas we don’t like to trim to avoid any debris being picked up by the trimmer and causing damage. For an additional charge, we can spray rock and mulch areas with weed & grass killer to permanently keep those areas looking clean. Excessive uncontrolled grass or weeds that border outside the lawn can be trimmed but would be at an additional cost. Edging with a heavy-duty metal blade cuts a clean line away from sidewalk edges. Sometimes we are asked if our mowing service includes “Edging” because the terms edging and trimming are sometimes used together. 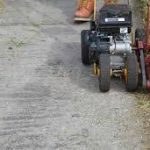 Trimming sidewalk edges with a string trimmer/weed eater is included with our mowing service, but we consider the term “Edging” a separate service from Trimming. Edging with a heavy-duty metal blade cuts a clean line away from sidewalk edges. Depending on overgrowth we would cut anywhere from 1″ – 8″ from the sidewalk. The process can sometimes take longer than simply mowing the lawn, so therefore would be an additional cost. Edging sidewalks is not something that needs to be done on a regular basis, yet more something that only needs done once or twice a season depending on individual preference. Edging can be requested completely separate from our lawn mowing service. Lawn aeration is a key service in maintaining a healthy lawn. 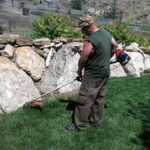 At Intermountain Lawns we specialize in maintaining beautiful lawns in Colorado. Lawn aeration is a key service in maintaining a healthy lawn. 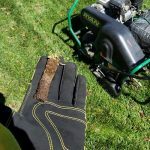 Why is lawn aeration important? Our Colorado soil has a lot of sand & clay. These materials compact very easily, especially as you mow your lawn, children and dogs play, and just good old-fashioned gravity. 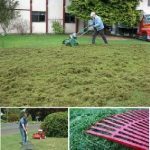 Core aeration or lawn aeration is the process of poking deep holes in your lawn and removing small soil and thatch plugs using an aeration machine that has several rows of hollow spikes. Just like any plant, grass roots cannot thrive in tight compacted soil; they need air, water, nutrients, and room to grow. By pulling out these small soil plugs from the lawn you’ve de-compacted the soil allowing the air, water, and nutrients to easily reach the roots. Aeration holes in your lawn allow room so your grass roots will become thicker, deeper, stronger, and more stress resistant. Aeration also improves tolerance for heat and drought stress and enhances thatch breakdown. Best of all aeration will save you money on your water bill! By loosening up the soil aeration helps reduce water run-off by allowing the water to absorb quicker. 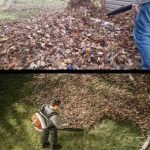 Leaf Pick Up is a crucial component to the health of your lawn. At Intermountain Lawns we want to save you time to concentrate on more important things. Spring & Fall Leaf Pick Up can be a very daunting & time-consuming task for customers but a crucial component to the health of your lawn. Un-picked up leaves can damage underlying grass during the winter by depriving roots from essential oxygen & sunlight. Even though grass is dormant and doesn’t require full amounts of water, oxygen, & sunlight compared to growing season, it still requires some. Excessive amounts of un-picked leaves can create thatch in your lawn. Dead grass, leaves, and other material break down over time, but excessive amounts will work their way past the surface layer of your lawn, through your grass layers, and down to the root zone where grass meets the soil surface. This harms your lawn by “choking” healthy grass. For Spring & Fall Leaf Pick Up we will do everything it takes to pick up as many leaves as quickly as possible by blowing, raking, mowing in all areas of the entire property, not just grass areas. We tailor Leaf Pick Up to your needs. In the Fall you may want to keep leaves in Garden & Shrub areas to help protect during winter vs. Spring you may want leaves underneath Shrubs & Gardens to be removed. Of course, we will do Entryways & Decks because leaves always somehow make their way into the house. From “Corner to Corner” we will get over and under any area you need. For the grass areas in the Spring it can also involve a Power Rake if requested. Power Raking or dethatching a lawn is a grass area specific service only performed in the Spring. Power Raking or dethatching a lawn is a grass area specific service only performed in the Spring. It is done with a machine that on the underside has vertical spinning teeth, basically a motorized rake. It is the process of raking old dead grass, old leaves, and unbroken down thatch out of your lawn’s Root Zone. Power Raking is not as important as Lawn Aeration for some lawns. Lawn Aeration itself will help with thatch if the thatch level is a ½ inch or less. Power Raking is not for every lawn but depending on the lawn it could be essential. If water doesn’t seem to want to penetrate the surface of the lawn, has necrotic ring spots, or has areas where you can see good green grass trying to poke through a lot of brown and seems to be struggling or “choking”, your yard could be carrying excess thatch and may need a Power Rake. A lighter or shallow Power Raking is recommended. Power Raking too deep can be damaging to the lawn making longer recovery time, but Power Raking done properly will remove matted turf and will promote a quick Spring green-up by letting air move to the root zone and warm the turf. Power Raking is a great idea if you’re going to over-seed, (out with the old and in with the new). Power Raking also allows for deeper Lawn Aeration holes. By removing a thick thatch layer, the aeration machine has less material to go through to get to the soil. When completed you will see all the buried thatch that has been brought to the surface. We then rake and/or mow all the debris. The process usually takes a little over an hour, in which raking thatch by hand with a metal rake may take someone several weekends! Looking for something not on our list? We might still do it or know someone that does, so just ask! Thank you so much for your business and we look forward to servicing you this year.